There’s a new e-bike company in Philadelphia, and it’s called Junto Bikes. 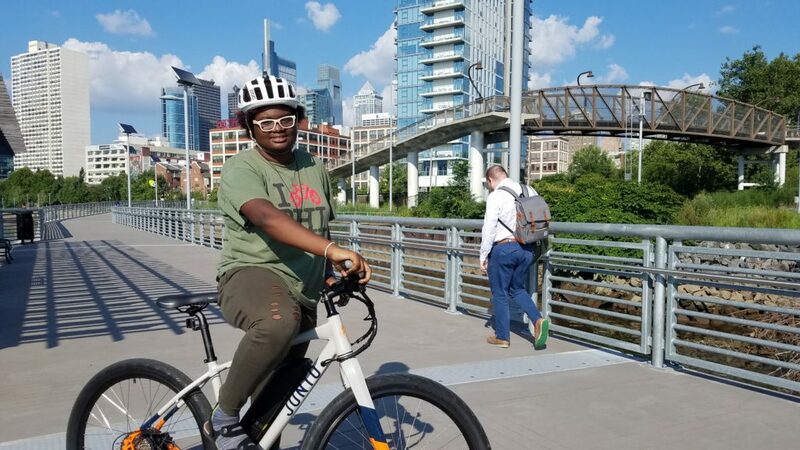 Started by Brian Powell, who we interviewed on our podcast recently, Junto Bikes is based out of Fishtown and can be bought both online and through Transport Cycles on Frankford Avenue. We actually interviewed Powell for our podcast, too, and you can listen to it here. Powell recently lent the Bicycle Coalition a couple of his bikes, and, well, we rode them. Here are our experiences with some Junto e-bikes. If you’re interested in learning more about e-bikes, check out this cover story from Grid Magazine. Riding the Junto was a new and a refreshing experience from my road bike. The Junto rides very smoothly and the thick tires help absorb the the everyday bumps and jumps of the road. My favorite part about this bike is that everytime you stop and start there’s that kick that comes with the first pedal stroke. It’s so much fun to stop and start again with very little effort and go flying down the street. On my road bike, i always have to put in so much work, but with the Junto i can just sit back, relax and cut commute time in half. I rode from the office down Spruce Street to Schuylkill Banks all the way to the end of the Trail at Cristian Street. Then rode back and up the South St. Bridge ramp, then across South Street to 24th to Bainbridge to 22nd and back across town on Pine to 16th and Locust. I enjoyed it a lot! It felt like flying. Took a while to get used to the weight of the bike and handling it with one hand when I used hand signals. But, I love how it accelerated at the green light and saved so much of my energy, especially on a hot day. It was my very first e-bike experience and I had a lot of fun. I had to attend a business networking conference at 7AM. This meant wearing a suit in July. I’m not a morning person. The Junto made everything worthwhile, my trip from Fishtown to the ‘Business of Sports’ conference in Center City was a breeze and I didn’t break a sweat. I arrived early, cutting a good 25% off of my normal commute time. I made three great connections with panelists who also arrived early. The power of the Junto allowed me to ‘take the lane” through the low stress streets of Kensington. It was easy for me to keep a 25 mile an hour pace just like the automobile traffic. The beefy tires and suspension of the Junto easily handled the potholes, trolley rails, and construction damaged streets – keeping a straight line down the middle. I love the straight bars and responsive brakes – gave me great vision and control in traffic. The electric assist gave my ride a sweet kick coming off a dead stop. Took the Junto from the office at 15th and Walnut St — 22 somewhat circuitous miles to my home in Edgewater Park, NJ Burlington County. I loved the boost that the motor provided every time I started pedaling. The wide tires and sturdy frame were great for this commute since there are two sections that are 4 lane roads with no bike lanes shoulders but there was a grassy area next to the road. Both of those segments have worn foot paths but a on my commuter bike. The Junto was just able to power through those segments which made my ride a lot less stressful than I was used to. I made in home in 2 hours and 3 minutes which is about 35 minutes faster than my previous bike only commute. In spite of the assist I still got a workout as I had to pedal for the bike to move forward. On the return the next day I took my bike on the RiverLINE to Camden, NJ. I was able to lift the Junto onto the bike rack. When I arrived in Camden I then rolled it up 3 flights of stairs using the steel running plates up to the Ben Franklin Bridge Walkway. Riding uphill to the top of the bridge was a pleasure without the stress of pedaling against gravity. In Philadelphia I got on Spruce St with its buffered bike lane and traffic lights timed to 20 mph. This allowed me to ride down the street with only two red signals between 4th St and 16th St. I saved about 7 minutes on my normally half hour commute from Camden to Philadelphia. I had my first thrill on the Junto when I hopped on the bike still in our office conference room to test out the seat height. I leaned up against the wall, and took one pedal stroke forward. What a thrill when I very swiftly found myself in the kitchen! Once I got outside and proceeded on my usual route home, I found the Junto to be intuitive, natural, and most notably, heaps and heaps of fun. Cruising down Pine St and Across the South St Bridge, the truly unexpected delight left puffed chest bicycle industry purist poo-pooer’s of the growing E-Bike market in my dust. Sign me up, baby! My commute is quite brief, but relatively hilly. I’ve got some experience on e-bikes, so I decided to use the max assist and see how quickly I could get home versus my normal commute, which is about 20-25 minutes. Leaving the office, I couldn’t really put the bike through its paces until I got west of 18th on Spruce due to congestion: cars blocking the bike lane. From then on, I was easily keeping pace with (and sometimes passing) free-flowing traffic. The only performance drawback was that at 20mph, I felt like I was working against the motor. The real difference was in the hills. I live in West Philly, and I ride a very fixed route that ensures no unnecessary climbing. This ride though, I just blasted straight up the 4300 block of Spruce (one of West Philly’s steepest) without a thought. I haven’t ridden a bike that way in years! The bike is quite responsive. It appears to have a pretty “tight” geometry like a road or mountain bike. This made it super fun to swerve around in, but perhaps not the best choice for everyday commuting. On that note, if I were to keep this bike, I’d need to install full fenders, a front rack, and some form of “auto on” lights. That 20-25 minute commute? Did it in 12! I moved to the area last December, and in March got my bike converted to an e-Bike by Philly Electric Wheels (http://phillyew.com/) in Mt. Airy. I’ve commuted just over 1000 miles total on it since then, from Lower Merion to Rittenhouse & back. It’s a little under 10 miles each way, mostly on the Schuylkill path, so I guess that means I’ve done it around 50 times round-trip. I had hoped it would mean I save money on train costs. With the crazy weather we’re having, I don’t save all that much on the train. But my family hasn’t had to buy a second car, despite living in a non-walkable part of Lower Merion! And the electricity is the difference between biking to work or not, since I’d for sure get sweaty without the boost. Also it would take a lot longer. I agree 100% with what’s expressed in this article, with one exception: I don’t get a lot of exercise. Some, yes, but you know how if you’re not riding fast on a bike, you get most of the exercise going up hills or fighting the wind? The eBike changes all that. It counts for something, but it’s really a lot less exercise. Thanks for the feedback Matt! Can you reach out to Leonard@bicyclecoalition.org? We’re putting together a panel of e-bike users soon that you may be a good fit for. I LOVE THE PHILLY BICYCLE COALITION! You guys are the BEST!!! You are a political & social force to be reckoned with!! !